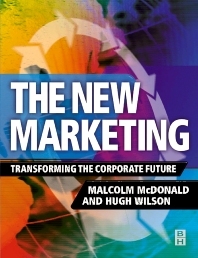 The New Marketing presents a comprehensively revised blueprint for the marketing process developed by Malcolm McDonald and Hugh Wilson to address second-generation changes brought about by technological development and the associated 'information revolution'. Built around the leading concept of a value exchange with customers, it provides essential advice on how to harness the latest technology and incorporate it effectively into marketing practice. The premise driving the new thinking in this book is that the early stand-alone experimentation with new marketing channels is over for many organizations. The key now is the total integration of new techniques and technologies within the wider marketing process. e-Commerce and CRM, for instance, no longer stand alone as something to plan for separately. Instead, the core processes of marketing need to take account of e-commerce and other IT-enabled channels such as call centres. Having worked on e-commerce and CRM strategy with a range of major companies over the last four years, the authors have developed tools and frameworks to fill these gaps in traditional marketing. The New Marketing draws heavily on this direct practical experience, and offers the ideal guide to tailoring your marketing strategy to the demands and opportunities of the 21st century marketplace. Professional marketers, CIM Members; Senior undergraduate and postgraduate students. New marketing: drive the digital market or it will drive you; Building the future on solid foundations: defining markets and understanding value; Planning for market transformation: determining the value proposition; Making the future happen: communicating and delivering value; Staying on track: monitoring the value delivered; Avoiding pitfalls: implementation issues; Focusing on tomorrow's customer: future trends and the implications for marketing practice.